LOSS OF THE MAJESTIC CAROLYN EBANKS WATSON I. For about·300 years, every year the Cayman Turtle Rangers went to the Miskito Cays off the coast of Nicaragua to catch turtle for their meat and shell, and shark for their skin and fins. All ofwhich were sold to England and America except for what turtle meat and eggs that wee consumed locally. They made two trips each year. January to May and July to September. Sometimes the trips could be financia1 disasters. If it was evident that they would not catch enough turtle and shark to pay for their expenses they would stop fishing and return. These were called broken trips. Sometimes they did not make the few Pounds Sterling to pay for the basics for their families. In West Bay, the merchants like Mr. William Farrington, Mr. Edison Ebanks, Mr. Stafford Ebanks and Mr. Prentice Powell, who owned Gatboats would supply the Rangers with flour, com meal, sugar, coffee, rice, and with plenty of salt. They would also supply the Rangers with denim to make pants and chambray to make shirts. The cotton line to knit the nets was supplied by the merchants. My father, James Whitmore Ebanks, better known as V. V. used to sit under the Hennings' sea grape tree, next to what is now the Silver Sands Restaurant, with other Rangers and knit their nets. 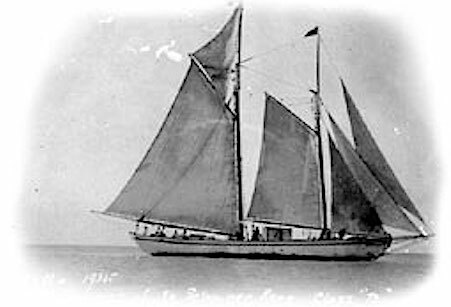 When going out, they would load their supplies on schooners such as the Adams, Goldfield, Wilson, Antarus and the Majestic who would take them down to the fishing grounds. He told me the names of many of the little Cays down there, such as Deadman Bar, Alligator Cay and how they made huts to live in and crawls to stow the turtle in. They drove sticks into the sand and tied them with thatch rope and fronds. There would be three men to a Catboat on each Cay. Two men to fish and one man to cook and do the other chores. Back here, it was the custom that when a schooner was due to arrive from the Cays, every morning, one of the older men would go down to William's embarcadere at North West Point and look to the South. He would be looking for the tip of the masts on the horizon. When he spotted the mast he would shout out, "Sail Aho!" and would go from house to house telling the good news. While they were gone the women were at home working very hard farming, making Silver Thatch rope to sell to Jamaica, and raising large, sometimes, extended families. Late in September in 1941, the schooners had gone back out to get bring the Rangers back home. They started arriving, but the Majestic was overdue. Everybody became worried because this was the hurricane season.